Working with all deliberate speed, I have finished the track leading up to the crossovers from both directions and the two ends of the layout are physically connected. That is not to say that I am ready to run trains around the basement. There are some feeders to install, gaps between (future) power districts to cut and the inevitable electrical gremlins to chase down; but I should just make it to my April 25 open house with at least one track operating. 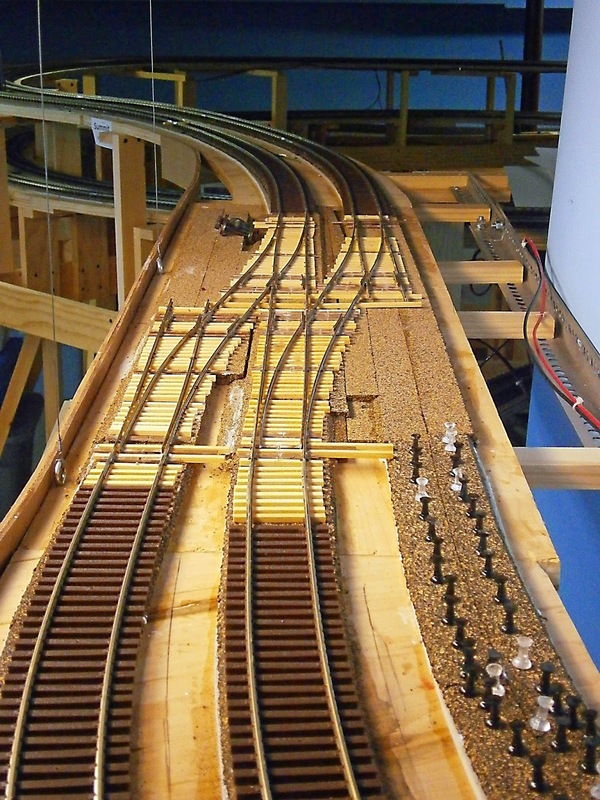 In the picture above, both tracks from the helix are connected to the crossovers (background) and two of the three tracks from Cranberry Grade are connected while roadbed for the third track (on the right) is coming along. I must admit, looking back along the Cranberry Grade is a great sight; and gives the flavor of the prototype. The downgrade track on Cranberry will only be usable if I can get switch machines installed on one of the crossovers by the 25th. If not I will spike the crossovers so that the one track from the helix feeds straight through to the center track on Cranberry. The third track on Cranberry might be installed, but unlikely that it will be usable.